Many of us who have a small home also have fewer bedrooms. This can often mean kids sharing bedroom space out of necessity. Other families choose for their kids to share a room based on family values. Whatever the reason, sharing bedrooms between kids can present some challenging decorating obstacles. How to find room for sleeping and playing? Keeping organized? Shared closet space? Individual tastes in decor? Let’s face it, sharing kids’ bedrooms can set the stage for a whole house war. We have the shared bedroom ideas for you! Inspiring ideas and a few great projects follow to help you create a great space for all your kids! ‘Pottery Barn Kids‘ has some great photos illustrating our first bit of advice… in a small room, think about arranging first. The “L” shape arrangement of beds worked best for us, freeing up more floor space for kids fun. Parallel beds may not be practical in a small room. That having been said, older kids may insist on it, simply so they can have their own “side” of the shared bedroom. But hey, they probably don’t need as much floor space as the younger kids, they are just going to strew their clothes all over it anyway… right? Have to put three kids in one bedroom? Here’s a great shared bedroom idea for making that arrangement work… You could also put another nightstand at the foot of the middle bed (if there is room), to make all the spaces more separate. Here is another shared bedroom arrangement option…end to end! Notice how each girl has her own wallpaper, but it works because they are both the same color scheme. From ‘Kidsomania‘. 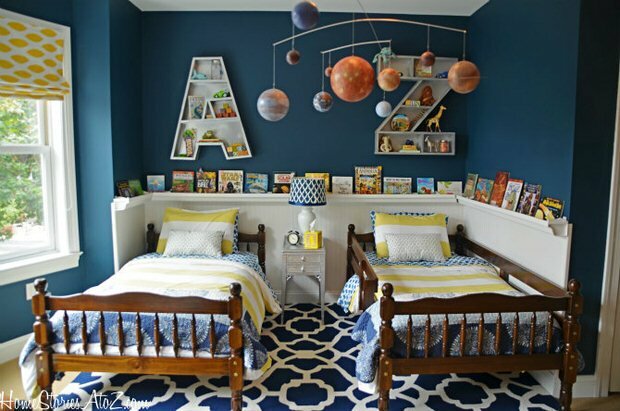 ‘Home Stories A to Z‘ made over their boys room, and the storage for the books is a really ingenious touch! Find out how to make their rain gutter bookshelves or tour the boys room reveal. Need to squeeze your kids into an awkward, converted space? These built in beds are a great idea for utilizing the space, and adding storage for each child, without taking up any more of the footprint of the room. From ‘Coastal Living‘. ‘Parents‘ magazine has a great shared bedroom idea for settling the “separate tastes” debate… Choose two hues, and let each child have storage, bedding and accessories with their own special color! These walls are just masked off large squares above each bed, painted in the childs’ color. 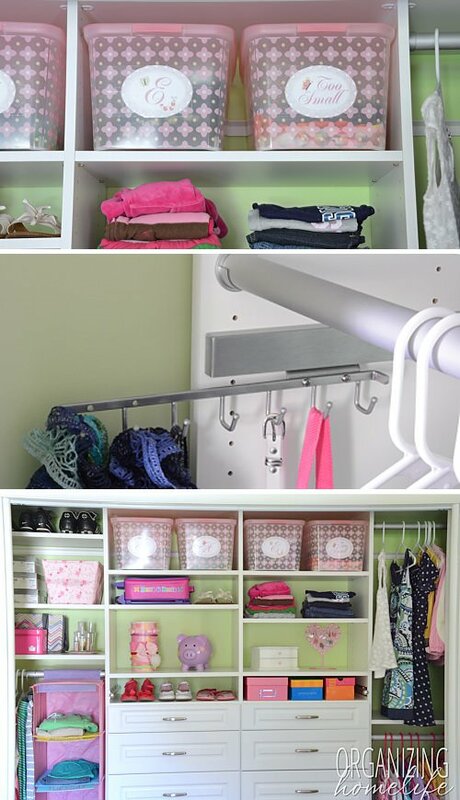 Need great inspiration on organizing a shared closet? ‘Organizing Home Life’ has its own shared kids room closet makeover! So no excuses! Get creative, make that space work with these shared bedroom ideas, and best of all, make it a fun space! We think you will want to check out our posts on DIY Kids Furniture and DIY Bunk Beds! Where would I find these beds? This is perfect for my situation. Hi – I love the huge “Sam&Jack” on the wall of one of your photos -what are they made of or where can I order the letters. I’m guessing they are abt 30″? Im sorry Kathy, it isn’t our project so I have no idea… If you look at the credit with the photo, you might be able to find a contact! Good luck! Any ideas on how the curtain was hung in yellow and blue room? I’d like to try that in my kids room. Thanks. If I was doing that, I would use one of those cable curtain hanging kits from Ikea! What is the colour of the walls and bedding in the first picture? I wish the brand and paint color of walls could have been posted. Very frustrating! What was used, in the first photo, between the heads of the beds?? Just a table of some sort? Or was something built specially for this space? I love the “too small” bin in the last room. I’m going to do that!